Barrels that are to be used for holding water must never be allowed to dry out. It is advisable that they should always contain at least some water and that if they are emptied then they should be re-filled as soon as possible. By always keeping some water inside it will prevent the barrel or tub from becoming too dry which can result in shrinkage. For further information on shrinkage refer to the Explanation of Shrinkage at the bottom of this page. Please refer to the 'Creating Water Gardens' section of our links page. Water butts and water gardens should not be allowed to dry out as explained in the Water Butts and Barrel Water Features Storage section. For products with a hand cranked cast iron pump you may find that if the pump is not used for some time then it may no longer draw water. This is because the pump contains a leather sealing ring that only works properly when it is moist. In these circumstances it is necessary to prime the pump by pouring a little water down the hole in the top of the pump through which the plunger bar passes. This will wet the seal and it should then be possible to use the pump again. For winter we recommend leaving water butts with water in them. Similarly water features should be left filled with water during winter since emptying them can result in shrinkage of the oak staves. Our experience is that freezing does not harm the feature, in fact we have had many features freeze in the winter and none of them have taken any harm. However we do not recommend operating the feature in very cold weather since the electric pump may be damaged (if your feature is fitted with an electric pump) if operated when the pipelines are frozen. If your feature has an electric pond pump then this pump should not be allowed to freeze. If it is a shallow pebble pond type feature that you have then it may be prudent to remove the pond pump. If you have a deeper feature then your pump will be submerged in deep water, which may freeze to several inches in depth on the surface but it should not freeze down as far as the pond pump. In this case it is not necessary to remove the pump. Barrels and tubs are made from oak, which absorbs water like any other wood. The wooden staves from which the tub is made will therefore always have a moisture content. As water is absorbed in to the wood it swells and conversely as wood dries it shrinks. A barrel consists of oak staves, steel hoops and oak ends. The oak staves remain in place because they are under compression created by driving steel hoops onto the barrel. Barrels which are used for holding water, liquor, beer, etc. rely on the moisture content of the wood to maintain the compression of the staves and thus they remain watertight. In fact it is the process of the staves absorbing water and their swelling which helps to seal a newly made barrel and it is the water from the contents of the barrel that maintains the moisture content of the staves. If a barrel is emptied and allowed to dry out excessively then the staves will eventually shrink and become slack. 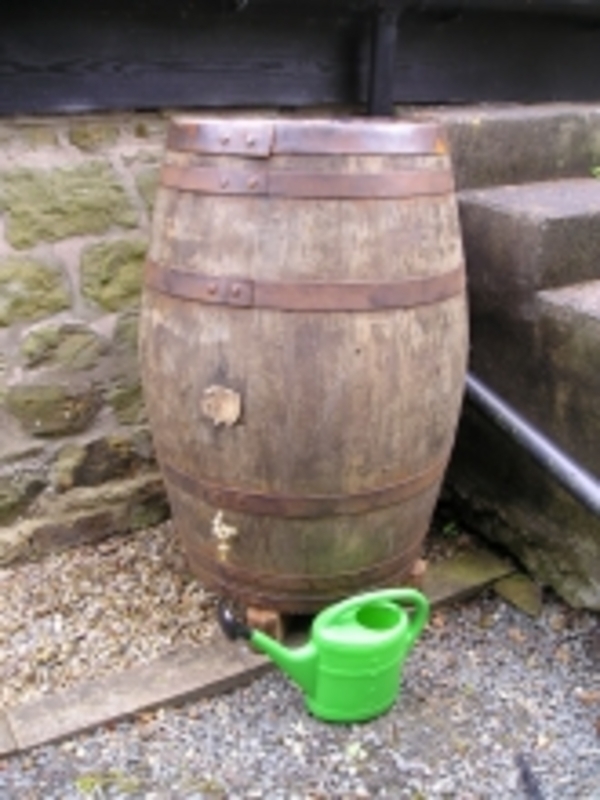 The barrel will then no longer be watertight and may even collapse under conditions of extreme dryness. If the shrinkage is not too severe then by repeatedly filling the barrel with water the staves will swell again and the barrel will become watertight once more. It is important therefore that water storage barrels and water gardens should never be allowed to dry out. Although it is not necessary for garden tubs to be watertight it is still not desirable to allow them to become too dry because they may shrink and become loose.